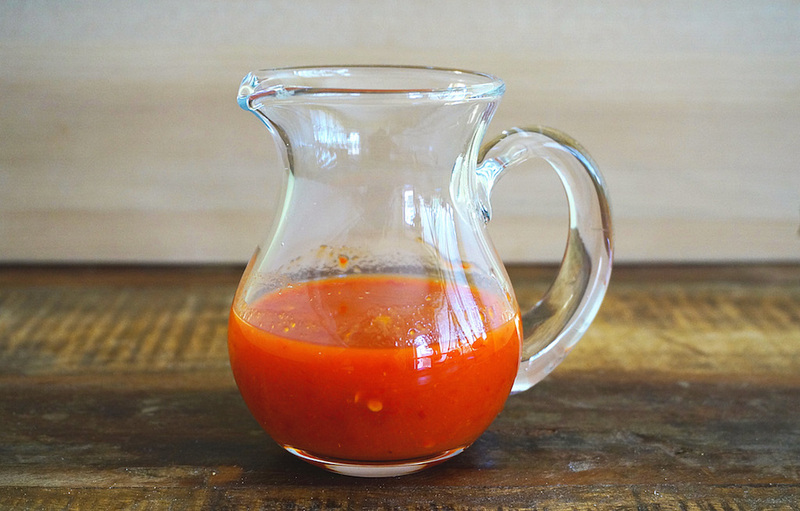 This classic Malaysian styled sweet chili sauce is spicy, sweet, and tangy. It's a great condiment for any savoury snacks, like fritters and fried tofu. You can make the sauce spicier with extra chilies, or sweeter with additional sugar. Keep the sauce in an airtight jar in the fridge for about three to four weeks. Blend chilies, garlic, and water until smooth and fine. Transfer into a saucepan. Add vinegar and sugar. Bring it to a boil. Simmer for about 15 minutes. Thicken with corn starch mixture and mix well and simmer for another 1 to 2 minutes. Once cooled, store in a refrigerator for about 2 weeks.